Early 1990's Helsinki, Finland. 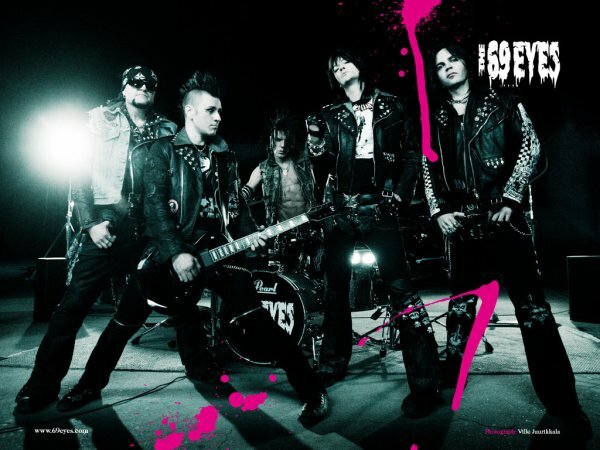 Five guys in Ramones-like black leather jackets have a band called THE 69 EYES. They are VERY loud: Iggy & The Stooges, Mot&ouml;rhead etc. Signed to the indie label Gaga Goodies. Records, tours; even in Sweden, U.K. and Italy; lots of chaos, broken hearts and distortion. Reputation goes before the band. Fan club in Japan. Dark industrial rock version of Blondie's "Call Me". More tours. More chaos. No mercy. "WASTING THE DAWN" was The 69 Eyes's first international release on ROADRUNNER RECORDS. In 1999 with its unique concept of Gothic melancholy mixed with hi-energy rock'n'roll roots of the band, the album not only brought some long-waited fresh blood into the Gothic scene but also launched a new term to the media: GOTH'N'ROLL. The album's epic melanGothic TOP 10 hit single "WASTING THE DAWN" paid a tribute to The DOORS' Jim Morrison and even had HIM's Ville Valo posing at a snowy cemetery as Mr. Mojo Risin' on its video. The band is said to be the missing link between The Cult and Type O Negative. "BLESSED BE" was released on the same date in September 2000 as The 69 Eyes got their gold records from the first single of it. The album rose straight to number 4 in the Finnish Album Charts and stayed over month in TOP 10 (3 months in TOP 40). The second single from the album was "BRANDON LEE" which also became a huge power-play radio hit and the single stayed 14 weeks in TOP 20. In the "GOTHIC GIRL" video the Crow-meets-Matrix like vision featured black Goth-hop dancers in the rubber nun dresses but "BRANDON LEE" with a mid-nightly dark teenage Romeo and Juliet dream was the video which became one the most requested videos for months in the music channel German VIVA2. The band spent the rest of year touring almost three months in Finland playing sold-out shows everywhere. Still surprised the band was voted in the biggest Finnish music magazine Soundi for NUMBER 1 in the Best Finnish Band, Album and Song categories - actually "Brandon Lee" was number one and "Gothic Girl" number two! Also the biggest German Gothic magazine Orkus, on the cover of which Jyrki was in October issue, voted the Eyes on the tops of the year 2000. The third BLESSED single and video release was dark and moody "THE CHAIR" which rose straight number 2 on the Finnish Single Charts in February 2001 and continued The 69 Eyes' "hit list" on the airwaves. The fourth BLESSED single "STOLEN SEASON" was released in May 2001 as the band successfully toured in Germany with Paradise Lost and continued touring through the European summer festival season. The final "Blessed Be" show for was played for mere 15 000 Goths at Germany's M'era Luna festival in September 2001. In October the band went back to studio with Johnny Lee Michaels to record their follow-up to the gold gone (in Finland) "Blessed Be". The first teaser single from it, "DANCE D'AMOUR" came out in December 2001 and has been number one in both the national radio and singles charts in Finland in January and February 2002 and it went gold again. PARIS KILLS itself is a majestetic masterpiece from the masterminds of the band and producer Lee Michaels. The band's guitar sound mixed with 80's keyboard sound and classic matured sense of melancholic melodies reaches its peak on the album which is according to the singer Jyrki "made to dance yourself to sleep just before the dawn". "It was perfect to start recording this album right after playing the final show of the tour in the front of 20 000 goths and have that "gothic for masses" vibe still going on as we worked for the songs," he adds. Like Depeche Mode's "Violator" PARIS KILLS is THE album for the band. Dark and stylish, some could even call Gothic-AOR, Johnny Lee Michaels' soundscapes and Jyrki's Cash-Orbison-Morrison disciplined vocals with catchy and yet beautiful songs make the midnight be true blue and bright.